LIN-5700-IP67-KIT-RS is a 24Vdc, 5700K LED strip specifically designed to illuminate architectural areas with a cool white ambience. Manufactured with an IP67 rating and an encapsulated cover, this offers seamless continuous light in various harsh environments. 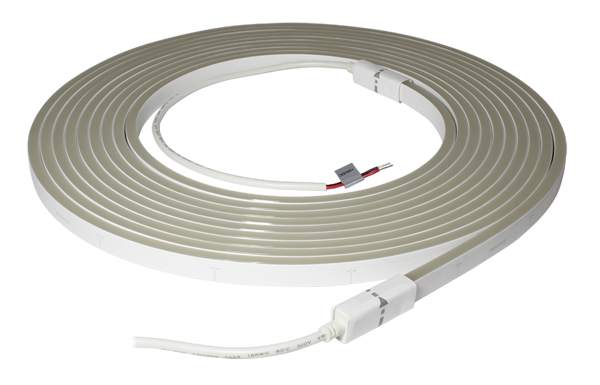 Performing with 5W and 60 LEDs per metre, it is also designed with a cuttable strip every 100mm, allowing adaptability and easier installation. LIN-5700-IP67-KIT-RS is a 24Vdc, 5700K Commercial LED, specifically designed to illuminate architectural areas with a cool white ambience, offering a 320lm (lumen output) performance. This 5W per metre commercial LED is manufactured with an IP67 rating and a UV Stable encapsulant which offers high resistance to both browning caused by the effects of UV, and also the negative effects of expansion and contraction caused by wet and moist weather conditions. The LED production and advanced connection system allows multiple lengths of Line LED to be connected together to offer the affect of one seamless length of diffused light. Made to be adaptable with a 12cm minimum bending diameter and 60˚ beam angle for a wide distribution of light, these features utilise a uniform of illumination, benefiting from easy installation around tight corners and sharp edges. Supplied as a continuous 10M length, the commercial LEDs PCB design allows one single unbroken LED length for a continuous light throughout the strip. Performing with 60LEDs per metre, the LIN-5700-IP67-Kit has been designed so that only the simple addition of an end cap is required at the designated 100mm cutting points, if this is a feature you require. Offering the opportunity to build to the customer’s specification ready for installation, we operate around the customer and their requirements. Our 5M energy efficient Lineo IP67 10M Kit is eco friendly and energy efficient, offering a 5 year life span.